Originally developed by Andy Granatelli for American drag racing, the Indianapolis 500 and World speed record breaking at Bonneville Salt Flats, STP has now launched a new, high performance fuel and oil treatment. This new, unique and immensely versatile treatment is formulated to keep all 2- and 4-stroke petrol and diesel-powered engines running at their best. Called MPMT (Multi-Purpose Motor Treatment), the latest STP product is the ideal engine companion, with extremely varied applications. Aside from cars, vans and, commercial vehicles, the benefits of MPMT extend to motorcycles, lawnmowers, chain saws and all powered garden equipment, boats, tractors and farm machinery. Containing a specially-formulated blend of fuel and lubricant additives plus anti-corrosion agents and moisture repellants, MPMT constitutes a complete engine tonic for year-round dosing to both fuel and oil. 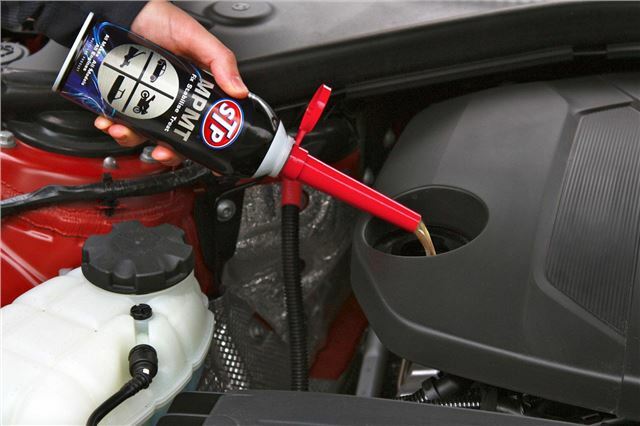 Illustrating the versatility of MPMT, a 500ml bottle will treat two cars as a fuel additive (petrol, diesel or bio-fuel), and equally is of value as an oil treatment or engine flush. One application delivers a wide range of benefits, including reduced emissions, extra engine protection, and cleaning/conditioning the fuel delivery system, all contributing to peak engine efficiency. For engines which are seldom used or laid-up for winter - such as classic cars, boats, jet skis, powered garden equipment - MPMT is uniquely-equipped to protect the engine’s internals and fuel system, and get engines on the move quickly and efficiently after storage. Providing a powerful and quick-acting preventative remedy to problems when engines are left idle for long periods of time, MPMT stabilises fuel, removes moisture and prevents corrosion build-up in fuel tanks and fuel lines. STP MPMT - supplied with a convenient screw-on spout for fuel tank dosing - is available now from Halfords and on-line (www.halfords.com), plus good accessory shops, at an RRP of £9.99. For information on the full STP engine car additive and maintenance ranges, visit www.stp.eu, call the UK helpline on 0845 6021995 or e-mail ukhelpline@armoredautogroup.com.